Howard P. Milstein, Chairman of New York Blood Center (NYBC)’s Board of Trustees; Fire Commissioner Daniel A. Nigro; and Christopher D. Hillyer, M.D., President and CEO of NYBC, joined to add the names of eight FDNY bone marrow donors to the Honor Roll of Life at the 11th annual induction ceremony at FDNY Headquarters. During the ceremony, Firefighter Michael McCauley, 26, of Engine Company 242 in Brooklyn met the recipient of his lifesaving bone marrow, Aaron Faulkner, 33, of Pittsburgh, Pennsylvania, a veteran United States Marine Sergeant who saw combat in Iraq. In March 2013, Iraq War veteran Marine Sergeant Aaron Faulkner, 33, of Pittsburgh, Pennsylvania, was pursuing a B.A. in Christian Ministries and awaiting the birth of his second child when he was diagnosed with acute myeloid leukemia (AML), a cancer of the blood and bone marrow. Aaron required a bone marrow transplant, but without a family match, his name was placed in the Be The Match® Registry. Very quickly, Aaron was matched with Firefighter McCauley and in October 2013, he received the donation of peripheral blood stem cells (PBSC) that helped save his life. Michael McCauley joined the FDNY in 2009, serving as an FDNY Emergency Medical Technician in Brooklyn and Staten Island before following his grandfather and uncle into the ranks of FDNY Firefighters in January 2013. Like thousands of FDNY Firefighters before him, Firefighter McCauley joined the Be The Match Registry while in Probationary Firefighter School at the Fire Academy on Randalls Island, knowing by doing so, he might be able to one day save a life. Three months later, he was contacted and told he was a match for a patient in need of a life-saving donation. In October 2013, just six months after joining the registry, Firefighter McCauley donated peripheral blood stem cells at Memorial Sloan Kettering Cancer Center. Michael is very happy that Aaron is doing well and hopes that he continues to enjoy his time with his family. 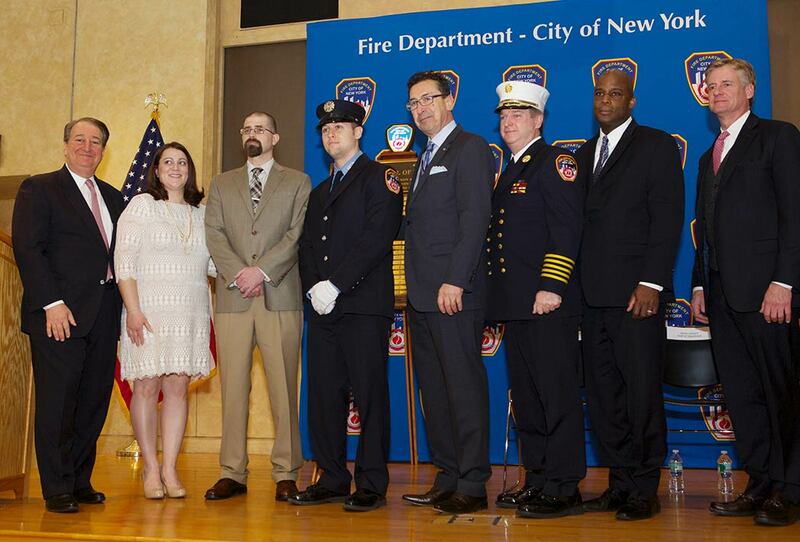 Members of the FDNY make up New York Blood Center’s single largest group of bone marrow and stem cell donors. To date, a total of 171 FDNY members have given these gifts to patients—in some cases more than once—accounting for more than 10 percent of all donors from New York Blood Center. 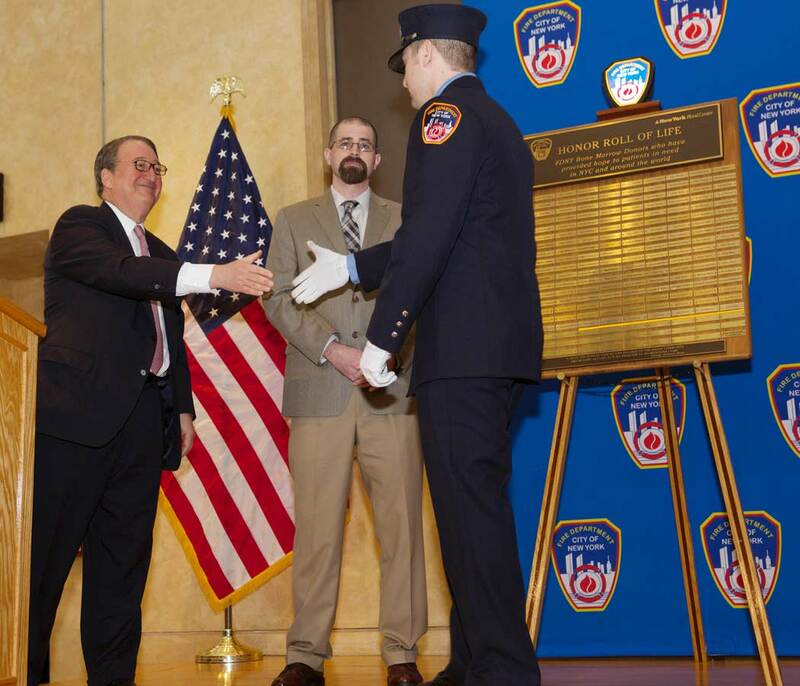 The FDNY/NYBC bone-marrow-donation partnership began in 1990. Over the past 20 years, the FDNY has become the single largest group on NYBC’s bone marrow registry, with more than 8,000 FDNY members on the donor list. Probationary firefighters are encouraged to sign up for the bone marrow registry during their training at the Fire Academy on Randall’s Island. This year marks the 11th anniversary of the Honor Roll of Life. In addition to participating in bone marrow donation, FDNY members run blood drives throughout the community. Last year, more than 2,100 blood donations were made at FDNY blood drives. For people with life-threatening blood cancers—like leukemia and lymphoma—or other diseases, a cure exists. Be The Match® connects patients with their donor match for a life-saving marrow or umbilical cord blood transplant. People can contribute to the cure as a member of the Be The Match Registry®, financial contributor or volunteer. Be The Match® provides patients and their families one-on-one support, education, and guidance before, during and after transplant. Be The Match® is operated by the National Marrow Donor Program® (NMDP), a nonprofit organization that matches patients with donors, educates health care professionals and conducts research so more lives can be saved. To learn more about the cure, visit BeTheMatch.org or call 1-800-MARROW-2. Howard Milstein introduces U.S. Marine veteran Aaron Faulkner and Firefighter Michael McCauley at the 11th Honor Roll of Life presentation.